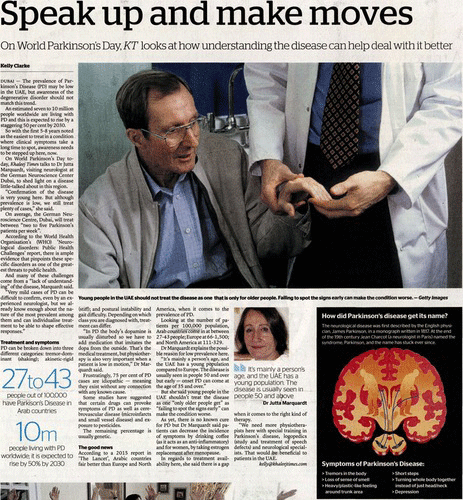 On World Parkinson’s Day, Khaleej Times talks to Dr Jutta Marquardt, neurologist at the German Neuroscience Center Dubai, to shed light on a disease little-talked about in this region. 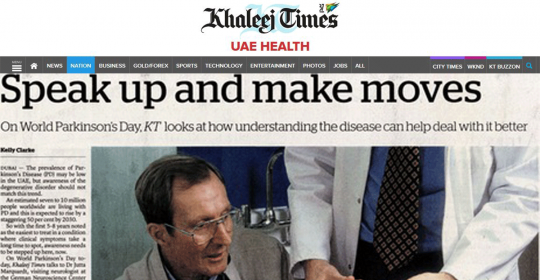 Khaleej Times | Kelly Clarke/Dubai |April 11, 2016: The prevalence of Parkinson’s Disease (PD) may be low in the UAE, but awareness of the degenerative disorder should not match this trend. An estimated seven to 10 million people worldwide are living with PD and this is expected to rise by a staggering 50 per cent by 2030. So with the first 5-8 years noted as the easiest to treat in a condition where clinical symptoms take a long time to spot, awareness needs to be stepped up here, now. “Confirmation of the disease is very young here. But although prevalence is low, we still treat plenty of cases,” she said. On average, the German Neuroscience Centre, Dubai, will treat between “two to five Parkinson’s patients per week”. According to the World Health Organisation’s (WHO) ‘Neurological disorders: Public Health Challenges’ report, there is ample evidence that pinpoints these specific disorders as one of the greatest threats to public health. And many of these challenges come from a “lack of understanding” of the disease, Marquardt said. PD can be broken down into three different categories: tremor-dominant (shaking); akinetic-rigid (stiff); and postural instability and gait difficulty. Depending on which class you are diagnosed with, treatment can differ. “In PD the body’s dopamine is usually disturbed so we have to add medication that imitates the dopa from the outside. That’s the medical treatment, but physiotherapy is also very important when a patient is low in motion,” Dr Marquardt said. Frustratingly, 75 per cent of PD cases are idiopathic – meaning they exist without any connection with any known cause. Some studies have suggested that certain drugs can provoke symptoms of PD as well as cerebrovascular disease (microinfarcts and small vessel disease) and exposure to pesticides. The remaining percentage is usually genetic. According to a 2015 report in ‘The Lancet’, Arabic countries fair better than Europe and North America, when it comes to the prevalence of PD. Looking at the number of patients per 100,000 population, Arab countries come in at between 27-43 people; Europe at 66-1,500; and North America at 111-329. Dr Marquardt explains the possible reason for low prevalence here. But she said young people in the UAE shouldn’t treat the disease as one “only older people get” as “failing to spot the signs early” can make the condition worse. As yet, there is no known cure for PD but Dr Marquardt said patients can decrease the incidence of symptoms by drinking coffee (as it acts as an anti-inflammatory) and for women, by taking estrogen replacement after menopause. In regards to treatment availability here, she said there is a gap when it comes to the right kind of therapy. “We need more physiotherapists here with special training in Parkinson’s disease, logopedics (study and treatment of speech defects) and neurological specialists. That would be beneficial to patients in the UAE. Breakthrough: Dementia Drug Could Prevent Serious Complication In Parkinson’s Disease Caffeine Level In Blood May Help Diagnose Parkinson’s Disease Parkinson’s not just a disease for old people, Dubai expert says Dance is therapy for Parkinson’s disease patients – Gulf News Dubai Parkinsons patients supported Parkinson’s Disease Dubai – what’s new this week?